The Anytron ANYCUT III is a state of the art laser finisher. Designed for the optimal die-cutting of 13″ media, the ANYCUT III provides top of the line speeds at an affordable price. With the ability to die-cut, slit, laminate, and remove excess material all in line, the ANYCUT III is sure to speed up your digital finishing processes. The ANYCUT III allows users to die-cut paper, PET, PP, BOPP, Lexan, and much more! Die-cut printed materials or create blank cuts for use with printers that can accept pre-cut materials. The ANYCUT III is the latest in state of the art finishing capabilities. The ability to laminate, die-cut, remove matrix, and slit all in line allows users to speed up their digital finishing exponentially. An in-line web guide keeps the media running straight and increases the tolerance of the laser to .02 mm. Easy to use software allows you to be up and running in no time at all and a touch screen display allows you to see exactly how your system is operating. The ANYCUT III is truly the next generation of digital finishing technology! One-stop laminating, scrap paper removal and slitting. 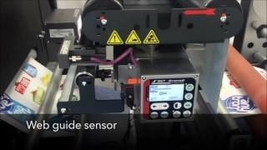 Different cutting methods for single label cut performance & no knife/knife edge replacements!